88.9 FM | Alaskan at Last! As we are just into the first week of our new year – 2017 – I guess it is only natural to do some reflecting and reminiscing. While not someone who enjoys dwelling in the past I must admit there are times I find it both entertaining and enlightening. Yes, I know this runs counter to the concept I regularly espouse regarding living in the ‘now’ but then human beings are not perfect and I am true to my ‘breed’ in this respect! As an aging male I can look back across my life and see so many stupid moves, self-destructive drives, wasted time and more than a few ‘what if’ situations; this is typical of most human beings. But there are also a relative few moments of inspiration, creativity, extraordinary love and epiphany. One thing that is common to all of the aforementioned is change. Such a recent example of change occurred on December 28, 2016 when – after a day and night of extensive reflection and consideration – I elected to severe my ties with KTNA in terms of support and volunteering. As most of you know I truly loved doing live radio so this was hardly an easy or straightforward decision. Indeed, after cementing the decision I’ve experienced many hours of self-doubt and rigorous introspection. Yet it has now been eight days and despite all the above and my own bent to question my ulterior motives when having made such a weighty decision I remain convinced it was the right choice. I continue on an emotional roller-coaster regarding the KTNA situation; that’s exacerbated by last Wednesday being the first time I’ve missed my music shows. Volunteering has become a lynch-pin in my daily existence; I went for three months without doing so back in August of 2013 but I had just relocated up here and I had a ton on my plate so I didn’t miss it; prior to that you’d have to go back to March of 2010 to find me not involved in volunteering. So basically I went seven years with at least one volunteering stint in my life and it has been almost three years since I’ve been handling two volunteering efforts coincidentally. I’m going to remain open to what volunteering possibilities exist but I’m not going to rush into decisions. I know I will add another volunteering effort again with some function in this area; I get far too much out of volunteering to walk away from the function. I knew this would be an impactful decision but knowing this to be the case ‘intellectually’ doesn’t mean one is prepared for the emotional and spiritual impacts. I thought about my decision across the past week almost constantly and it has intruded upon my dreams during those nights. It really has been a tough time but then I knew I wasn’t going to break a three year relationship, which included me being named ‘Volunteer of the Year’ for 2015, without some grief and pain. And, as expected, I’m second guessing my decision even though I know it was the right one. The GM called me the day I resigned but I answered via email and have kept that as our means of communication. She did make a couple of halting attempts to get me to reconsider but I also believe a lot of her impetus is based on the fact the Saturday Evening Announcement program (I did this in addition to my two hours of music on Wednesday afternoons) is extremely difficult to cover. You need someone who is reliable, a year round resident, willing to give up part of their Saturday evening and able to handle the broadcast and any potential issues with no additional help onsite. Such a volunteer is indeed tough to find as sadly it is the first requirement that is often not present in potential volunteers. I harbor more than a bit of guilt about deserting my listeners; I just hope they understand my motives. My impetus to give up my live radio ‘career’ stemmed from an ideological break with NPR in general and KTNA in particular. As such, it was based on ‘principles’ and often such decisions are the toughest to resolve and then put into place. I was never completely comfortable volunteering at a NPR outlet because I do not believe any form of mass communication should be funded – even partially – by the government which really means by the people. And, to me, NPR has a decided liberal lean which is something I do not share. But I also recognized what the station did, and does do, for the local communities in terms of reporting on dangerous situations, weather, local events and local news. When I was volunteering and supporting KTNA it was these functions I really backed. All the other radio stations in this general area pretty much end their coverage in Wasilla and that’s 60 miles south. With the current crisis in Alaska’s budget and across the board financial cuts KTNA is going through changes. Most of the former staff were either riffed (reduction in force) or retired. One of the latter was the GM; his replacement came on-board a few months back. Since that time I’ve seen more and more movements to the left in the station; it was this perception and a confrontation with the GM regarding some requirements I had been bending that finally caused me to completely re-evaluate myself with respect to supporting KTNA. In hindsight this was probably the infamous ‘straw that broke the camel’s back’. And so it is I find myself moving on with my life while continuing to collect learnings and working to discover new opportunities. In my case three years of volunteering and supporting KTNA finally culminated in a major shift in my life. I’m trying to remember that all change is beneficial and positive energy can arise from even negative situations; I need ‘only’ remain receptive to such energy. So once again I’ve re-espoused that ‘time is the forge upon which change is fashioned’! Here’s most of the 2014 KTNA volunteers gathered in front of the studio for a group shot taken during the ‘KTNA Volunteer Appreciation Picnic’ held on June 12th. Many people have asked what I look like as I’ve mentioned the image I use as an avatar is from 2003; therefore I decided to post this picture. I’m the fat head in the back row with the shaved head and red shirt and vest. A Wonderful ‘Thank You’ From KTNA! 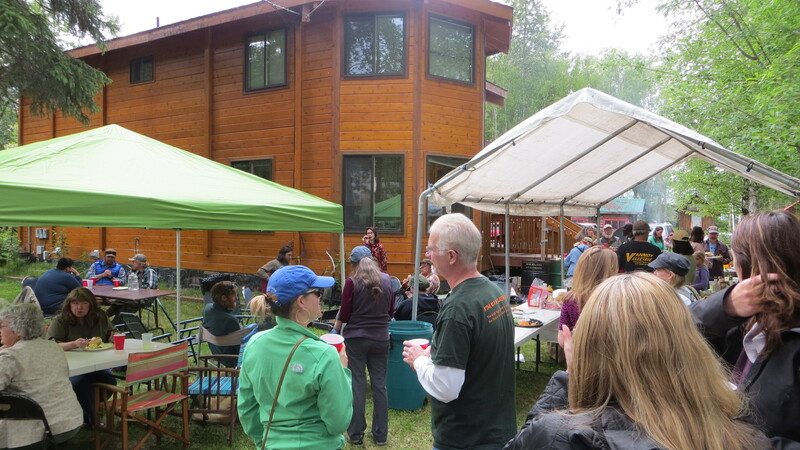 Last Thursday the staff at KTNA held their annual ‘volunteer appreciation picnic’ and I was impressed no end with the great food and wonderful companionship as well as some truly memorable live music. I’d guess there were maybe 60 to 75 folks in attendance; the staff set up a large tent to cover the food and a myriad of tables and chairs. They cooked a variety of hamburgers, sausages and vegetables to order which went well with all the ‘fixin’s’ and, of course, a couple of pony kegs of locally brewed beer. We even managed to get a group picture of the current bevy of volunteers who help make KTNA the ‘Voice of the Susitna Valley’. My neighbor Larry was there and played his electric guitar with another gentleman who was very skilled on his acoustic guitar. As good as these folks played when Kayti sang with them it was just incredible. She’s obviously a very young woman but she has a very strong voice and she was equally adept at rock, blues and jazz vocals. She could sing most song’s lyrics from memory. 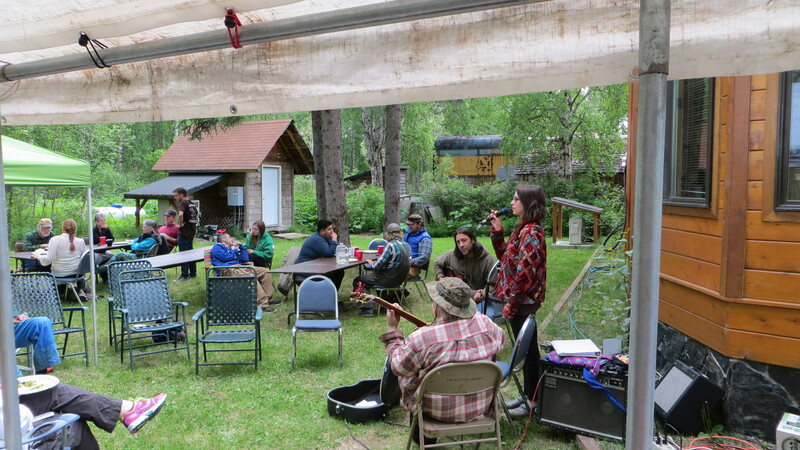 I know there is a plethora of artistic talent in the Talkeetna area but in my estimation Kayti should be singing for some group touring the US! Even the weather cooperated with overcast and cool temps with just a brief period of misting. The locals told me last year the air temps were in the upper eighties; I’ll take the upper fifties we saw this year any day!! Great people, great food, really great music and a fantastic Thursday afternoon!! Settling into life in rural south central Alaska isn’t just about learning to handle wild weather swings or coexisting with large mammals; establishing one’s societal links is at least as important as anything else. The term ‘rural’ when applied to Alaska has many levels from living without things like telephones and even electricity to being part of a neighborhood with paved roads and septic fields. Being rural in the Talkeetna area tends to land somewhere in the middle of this range; I have electricity, broadband connectivity via the phone lines, fuel oil heat supplemented by an oil drip furnace for those times the electric grid crashes, an on property well, a septic field and a well insulated two story home. In my instance I have perhaps two to three neighbors as close as maybe a tenth of a mile although none are visible when the trees have foliage. There are perhaps eight residences within a half mile of my place; that’s about the kind of population density I was seeking when I traveled here in early April of 2013 to locate my new home. As such its very easy to become isolated from other people; I do see maybe five cars a day travel past my place on East Barge Drive but I really only hear them because I do not have direct sight of the road. When walking the dogs I usually see one or two of my neighbors and we wave and sometimes stop briefly to talk but that’s about it. Within a few weeks of relocating I began to realize I would need to expend a lot more energy to develop some solid relationships with select locals. At first I was a bit lost regarding how best to undertake this but thankfully my realtor and good friend Holly had already provided me the means when she’d championed volunteering at Talkeetna’s local radio station (KTNA – 88.9 FM). She has been doing so for years and currently does the Friday noon local news cast and has a music program at 13:00 on Fridays. Once I had finished my unpacking and mostly finished organizing my place I decided to give this a try. KTNA is a NPR outlet and initially this gave me pause as I am not enamored of NPR’s sometime liberal bent and I have philosophical issues with the concept of my tax dollars funding such a function. However, I soon recognized that KTNA is the only reliably received radio station in this area and is the only station with local news, weather and information. As such it is an extremely valuable resource to the local community. 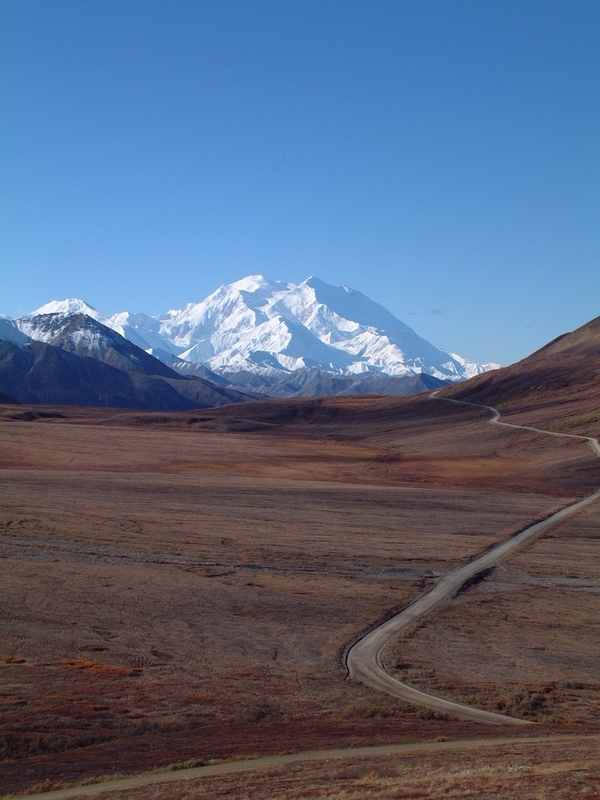 When still just visiting Alaska on my annual trips I remember hearing a program segment of the local news while driving up the Parks Highway in this general area called ‘Denali Echoes’. I was initially dumbfounded when I heard messages like; “Tom, please meet Julie at ‘Latitude 62’ (a local Talkeetna restaurant and bar) on Friday at noon”. I then came to understand this function served folks who did not have reliable, or in some cases any, phone service. In addition KTNA is the go to source for local information in the event of severe weather (there is no NWS broadcast reception for this immediate area), flooding, earthquake information and similar. Because of this I came to appreciate just what an important job the station fulfilled and I wanted to be a part of this support function. During their recent pledge drive in mid-October I visited the station when Holly was answering the phone and met a number of the staff and many volunteers; to a person I thoroughly enjoyed these folks. They really do mirror the range of personalities that make Talkeetna the quirky but friendly place it is; one of the volunteers (Lisa) said Talkeetna reminds her of the ‘Isle of Misfit Toys’ in the Rudolph the Red Nosed Reindeer movie and after a moment’s reflection I couldn’t agree with her more! 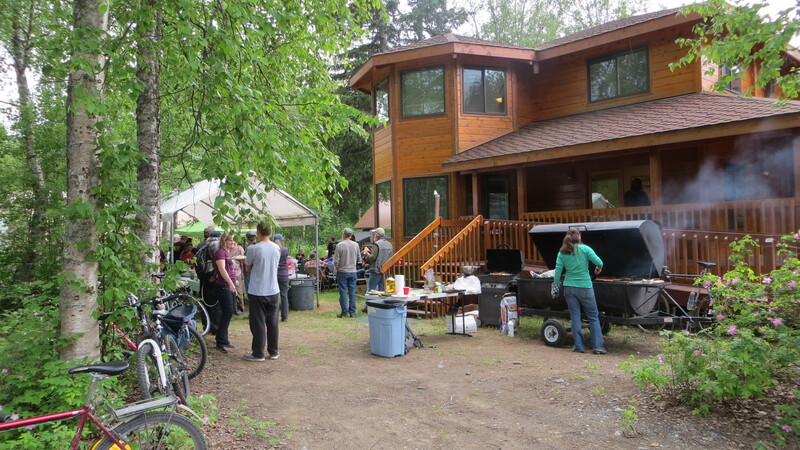 The folks I’ve met in this area are truly individuals who share a deep love of Alaska, are largely self sufficient and tend to be very extroverted and outwardly friendly. I really came to enjoy working with Deb (program director/volunteer coordinator); she has given me a good foundation in the operation and functionality of the studio as well as a great overview of the station. I underwent a pair of training sessions with her in the studio and now have carved out a couple of hours across two days for practicing giving the on air newscasts. This coming Tuesday (November 5th) I’ll be actually doing my demo tape which along with a written test is a sort of graduation exercise. Providing I don’t botch my demo and pass the written test Deb has plans for me to start reading the evening news (local newscasts on weekdays are at 07:40, 12:00 and 18:00 local time) sometime the end of this week. As a volunteer I was ready to do whatever was needed and I must admit I was a bit surprised I’d been picked to read local news; I was expecting to start with something a bit more pedestrian and then work my way up. However, as a volunteer I’m ready to do what is needed doing and apparently coverage for the evening local newscasts has been very thin of late. Because of my background in IT field support and my lengthy experience with building PCs, setting up wired and wireless networks, learning software and troubleshooting all of the aforementioned I was able to assist Deb with an issue on the studio Mac even though I know very little about Apple products. As such I suspect along with being a local news reader I will be assisting the station and staff with system related issues and also perhaps suggesting upgrades; to really be functional in these arenas I will need to learn the Mac OS much better but that just requires some time. I do enjoy being able to assist where ever I can and I already know such assistance is welcomed by the KTNA folks so it really is a ‘win-win’ situation for all involved! By volunteering some time at KTNA I will have the opportunity to meet and interact with many more local folks and that’s something I truly value. I suspect that as winter comes on – at least assuming it does as its unheard of to have no accumulating snow by the start of November yet all I see is bare ground as of November 3rd – having a place to interact with other Talkeetna residents will become even more important to me. I’m also hoping that by assisting the station with system and network related issues I will be able to get my name out into the community as someone who is willing to work on systems and networks. While I could probably make a bit of income doing this my real goal is to get myself inculcated into the barter system. I would be happy to do system repair/upgrades or similar network efforts for just the cost of any parts; I’ll bank reimbursement for my time and expertise such that years down the road when I need my roof worked on or the well serviced I’ll be able to call in some favors. That’s just one more aspect of rural Alaskan living that I’m looking forward to indulging within..!